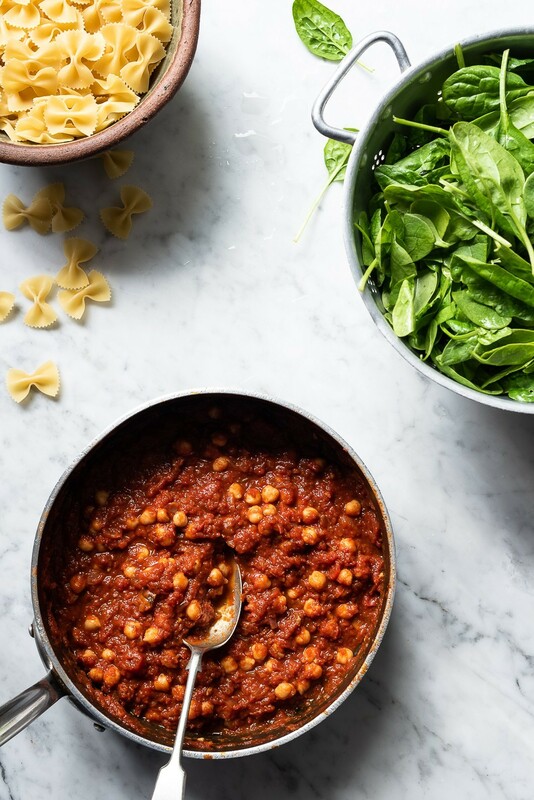 Except for the greens, this spinach and chickpea pasta is made entirely from store cupboard ingredients. 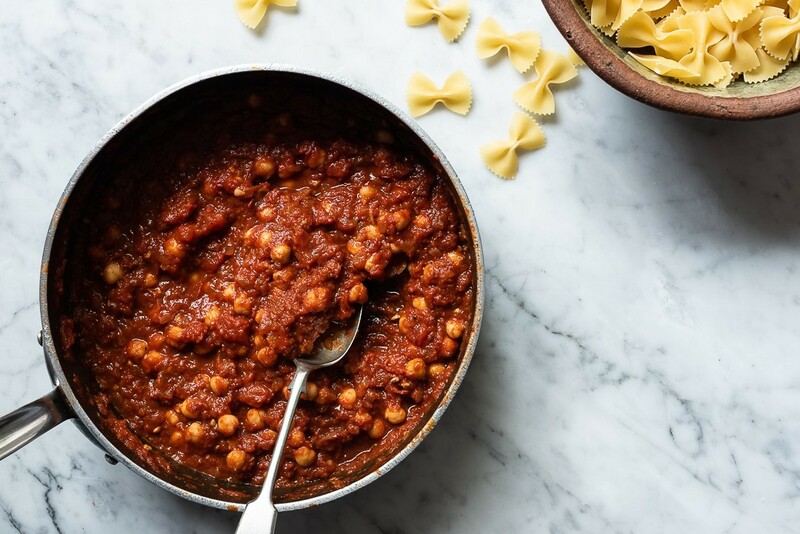 Think tinned tomatoes, pulses and punchy pastes that add instant oomph. 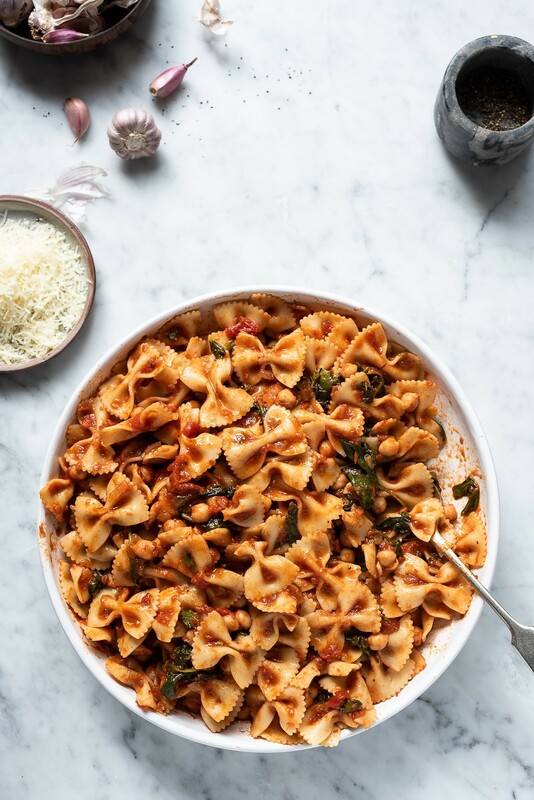 No pantry worth its salt is complete without Italian staple, pasta, so there’s that, too. If you’re a regular visitor here, you’ll know I’m all about fresh ingredients and cooking from scratch. When it comes to tomatoes though, my shelves are always stocked with tinned options – whole, finely chopped or pureed. Tinned tomatoes are kitchen essentials, like good olive oil, lemons and flaky sea salt. They’re good for shakshukas, wintery casseroles and soups, and especially handy for quick pasta sauces. I remember going to Italian friends for supper, years ago. 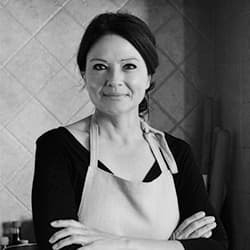 Felicé was in the kitchen making the first of many courses – Napoletana pasta. He stood at the stove, half apron tied at the waist, sweating minced garlic in olive oil. After the briefest minute, he tipped in a huge tin of chopped tomatoes, the sort you’re likely to find at your local Italian deli. The only seasoning was salt and a grinding of black pepper. That was it. Sauce done. Pure and simple. It tasted clean and very authentic. This sauce is similar but with a few additions to bulk it out. 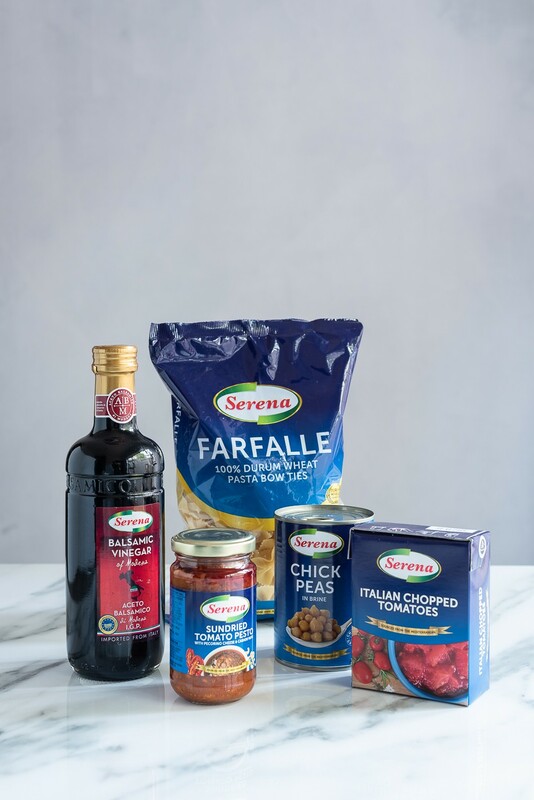 For the recipe, I’ve partnered up with Serena to make an easy family style supper using 5 store cupboard ingredients. It leans on plant-based eating that’s wholesome, quick and inexpensive. It’s the kind of food you can rustle together when you’re short of time or when midweek inspiration is on the decline. 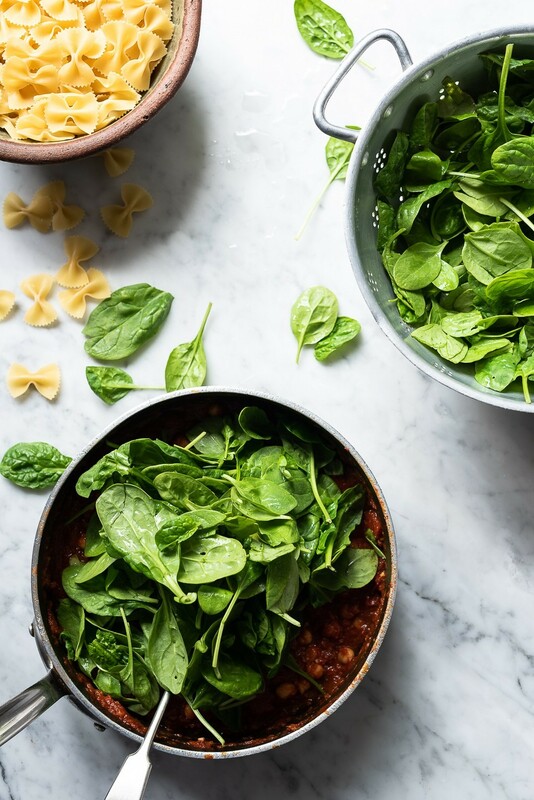 The sauce can be made the day before and reheated, in which case, add the spinach while the pasta water is on. The lack of meat is intensional but more than compensated by the gutsy sauce. To spur the flavour on, I add a splash of balsamic vinegar and 2 heaping spoonfuls of sundried tomato pesto. It’s untraditional but very good. When cooking pasta, the general quota rule is 75-100g dry weight pasta per person. I used 400g here and it made ample, enough for at least 6 generous servings. 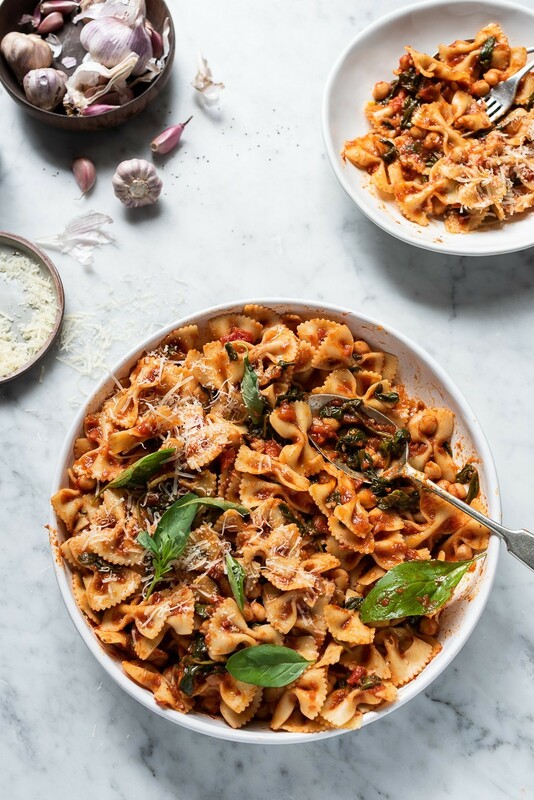 Farfalle (bow-tie pasta) keeps its shape well when cooked so any leftovers can tag along to work for a desk lunch. It’s best reheated. If you feel life would be better with meat, add strips of roast chicken or scrunched up pieces of panfried salami. Heat the olive oil in a wide-based pan and sauté the onion until softened, about 6-8 minutes. Add the garlic and cook for another minute, then add the tomato pesto and balsamic vinegar. Add the chopped tomatoes, oregano, chilli (if using), sugar and water. Cover partially and simmer for about 20 minutes. Season the sauce with salt and black pepper. Add the chickpeas and heat through. Pile the spinach on top of the sauce and wilt down, about 3 minutes. Cook the pasta in plenty of well-salted boiling water. Reserve 1 cup of pasta cooking water before draining. 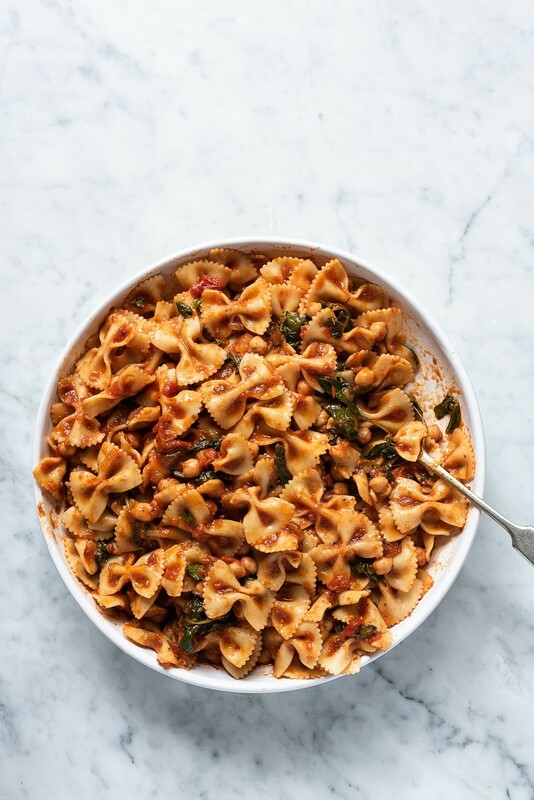 Tip the pasta into the sauce and toss together. Add some of the cooking water to loosen. Add a generous handful of basil and finish with grated parmesan.